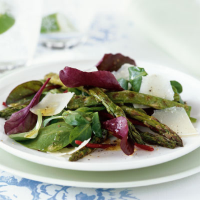 Make the most of the season's English asparagus with this easy starter. The spears are quickly chargrilled in a griddle pan to retain their colour and bite. To make the dressing, place 3 tablespoons of the extra virgin olive oil with the vinegar, mustard and some seasoning in a screw-top jar and shake well. Alternatively, whisk the ingredients together with a fork in a small jug. Remove any woody stems from the asparagus by bending the end of the spears. They should snap easily at the point where the woody part begins. Heat the remaining tablespoon of oil in a griddle or frying pan. Place the asparagus spears in the pan in a single layer. Cook for 5-6 minutes, turning the spears once, until they are slightly charred and just tender (you may need to do this in 2 batches). Place the salad leaves in a bowl, pour the dressing over and toss lightly. Divide the salad and asparagus between 6 plates. Scatter over some Grana Padano shavings and season with freshly ground black pepper. Serve immediately. If you prefer, serve the asparagus with a ready-prepared hollandaise sauce (available from the grocery section) instead of the dressing. A crisp, ripe Australasian Sauvignon Blanc will match the asparagus and citrus flavours.